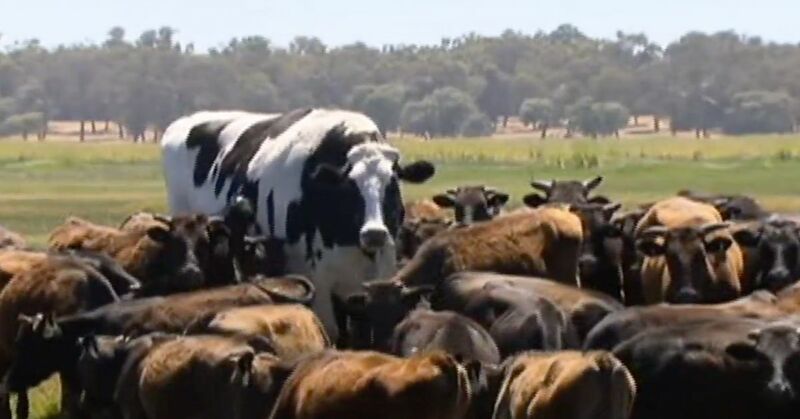 Yesterday, the world was introduced to Knickers, an extremely large Australian bovine. The steer was a sight out there in the field, towering benevolently over his smaller female peers. (No, Knickers is not a cow. Cows are female cattle who have had a calf; a steer is a neutered male.) The very big boy is a Holstein Friesian, a breed that originated in North Holland and Northern Germany that humans have been breeding for dairy production over the last 2,000 years. He lives on cattle farmer Geoff Pearson’s property in Western Australia. According to The Guardian, Knickers stands 6 feet, 4 inches from hoof to shoulder — that means he’s only three inches shorter than a Mewtwo — and he weighs approximately 1.5 tons, or a little more than a Toyota Corolla. While Knickers’ size is certainly his most obvious characteristic, it isn’t really the most salient. “I am not sure he is so much a freak as just a tall Holstein,” Alison Van Eenennaam, a professor at UC Davis’ Department of Animal Science and a leading researcher in animal genomics, wrote in an email. “We have a steer in California that is 193 cm and the Guinness Book of Records has a Holstein cow that is 193 (6 foot 4 inches).” Danniel, the aforementioned Californian steer, died this year at eight years old. While he was still around, “he would eat 100 pounds of hay and 15 pounds of grain and drink 100 gallons of water a day,” wrote Honolulu’s Star-Advertiser. Knickers might blend in more if he’d been pictured hanging out with a herd of gaur, which are wild cattle from India that regularly grow to about 6 feet at the shoulder. He also could have held his own in ancient Europe, where giant bovines called aurochs roamed the land.